We gave the Delsey Helium Aero an excellent rating. So we were curious about its younger cousin, the Delsey Helium Titanium carry on. And to our delight this carry on bag ticked pretty much all of the boxes. It provides a premium experience for a lot less money than most other luggage of its quality. Feature-wise it is also on-par with the big guys. Overall, color us impressed! The Delsey Helium Titanium hits a real nice sweet spot in terms of features, durability and decent price. We'd say that you should strongly consider the slight increase in price for the TravelPro Platinum Magna 2, but this is also a really great bag! Delsey has quickly become one of our favorite bag companies in a the past couple years. Somehow they are able to put really high quality parts together to make really great bags at a fraction of the cost of the likes of Briggs & Riley, Tumi and Eagle Creek. While you’re not getting quite the same luxurious build quality and features with a Desley bag, you are doing damn well for the price. We’re talking really high quality spinner wheels, large functional zippers and enough thoughtful packing options in the inside. As you can see below, the Desley Helium Titanium is a clamshell design, with almost half of the internal volume dedicated to a zipper pocket that fills out the upper lid. We love this design for the simple fact that it basically makes you pack like you are using packing cubes. In fact, throwing an Eagle Creek packing cube in the upper lid is an even better idea as it allows you to quickly add and remove things without having clothes floating around loose in the pocket. I can’t say this enough, buy packing cubes! The internal fabric is a slight step down from the Delsey Helium Aero’s more silky cloth fabric but is totally practical and seems very durable. The outer shell is where this bag really excels. It uses 100% polycarbonate which is one of our favorite materials for building lightweight hard-side luggage due to its durability and light weight. And believe us, this bag is light! At just 8 pounds this bag does a good job at feeling light in the hand. Measurement-wise this bag fits nicely in overhead bins on most flights with dimensions of 20.8 x 14.2 x 10.2 inches. Now this may be slightly too large for some budget airlines in Europe, so do check the baggage requirements for your flight. When in doubt, take a look at a specific international size carry on bag instead so you are sure to be able to take it into the cabin. Looking for something with even higher durability and quality? Take a step up with the TravelPro Platinum Magna 2. This is our pick for the overall best bang for the buck in carry on luggage. Period. This bag also includes a fair number of bells and whistles. It features an integrated TSA lock which is surprisingly easy to use. We have seen other bags with these locks be a little hard to use but the Delsey Helium Titaniumis pliable enough to pretty easily allow for aligning the zippers into the locking mechanism. In fact, we like this TSA lock solution even better than the Delsey Helium Aero believe it or not. Delsey offers their limited worldwide 10 year warranty on this bag. This isn’t best in the industry by any means but it is better than nothing for sure. It’s no Briggs & Riley with their insane lifetime warranty that literally covers ALL damage, even from baggage handlers, but its decent. 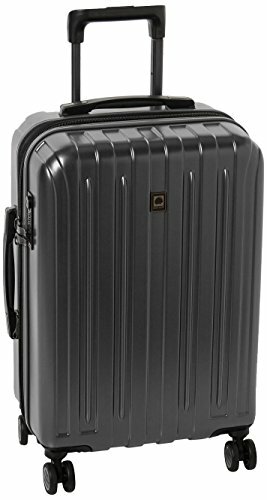 Delsey Helium Titanium Carry-On review round-up: Is this bag for me? This is a really good bag for the price. You aren’t going to blow minds with it, but it is easily in our top ten bags at this pricepoint. We’d say that you should weight your options between this and the excellent Delsey Helium Aero if you have your heart set on a Delsey bag (which is a great choice). But do yourself a favor and also check out the TravelPro Platinum Magna 2 which is an absolute beast of a bag.